Friday morning, just 3 days ago, it was snowing and really windy. There wasn’t much accumulation but there were a few cars driving around with an inch or so piled up on the windshield wipers. And the wind….whew! It made all the bee equipment drying on the back porch go skittering and tumbling. 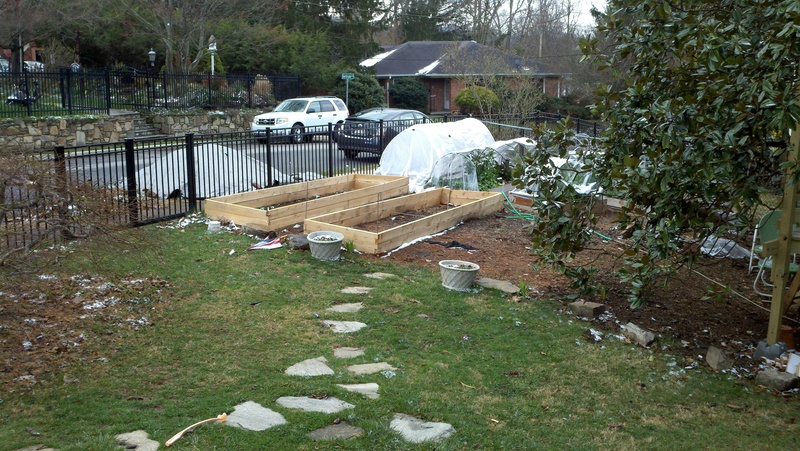 For the garden, it meant battening down the plastic on my new hoophouse (top right in photo). 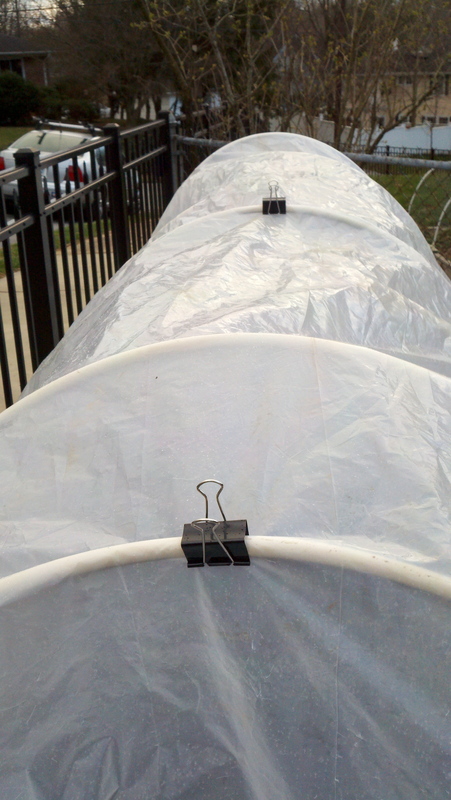 Three of the beds are already covered with clear vinyl over the pvc hoop frames, and that vinyl is secured to the hoops with zip ties. One problem with the zip ties is that if I want to undo them I have to cut them. In a sense, they’re permanent. It’s worked fine for winter when I didn’t really need to do any uncovering, but now that I’ve got this new covered bed with recently-planted seeds, I need something more temporary with spring coming on. Here’s where the internet comes in handy when gardening. I googled “clips for pvc hoops raised beds”. Sure enough, I found a great idea from Dropstone Farm (way out in Washington State). 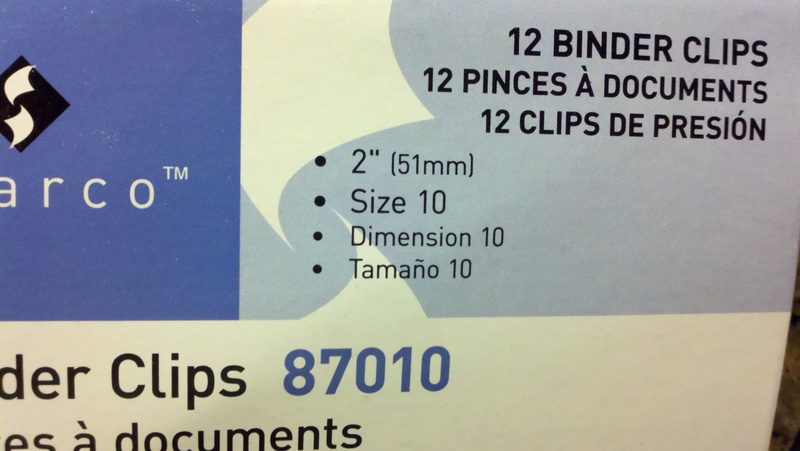 Jumbo binder clips! Then I found some by digging through the junk drawer and a pile of my husband’s office stuff, and got him to bring a few more home. 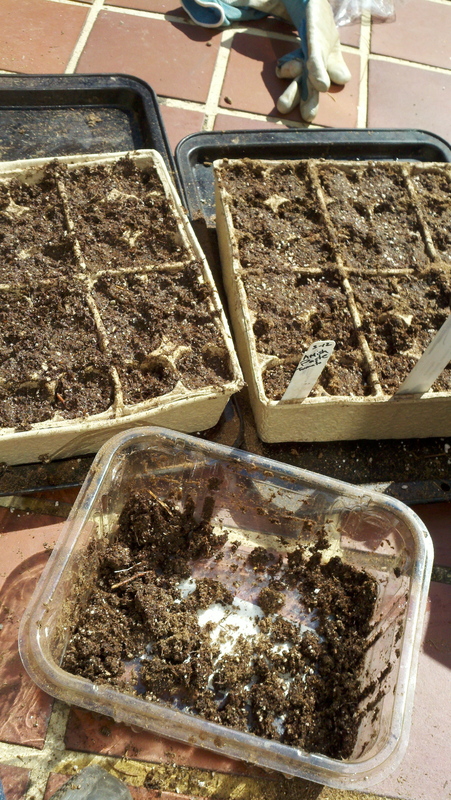 After such a blustery cold day, we were skeptical that Saturday would be up in the 60s as forecasted, but sure enough, it was a most glorious day, and I was able to easily take the binder clips off and let the new seedlings get some rays. 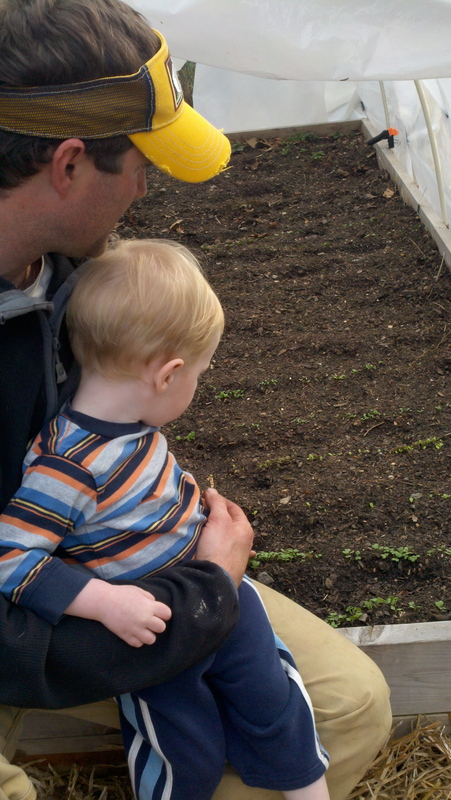 A note on seed starting: with my kids being so little, I’d skipped the seed starting part of gardening the past few years in an effort to make it simpler because my time was limited. During that time, I had also forgotten that potting soil mix has a *very* annoying water-repellent quality. 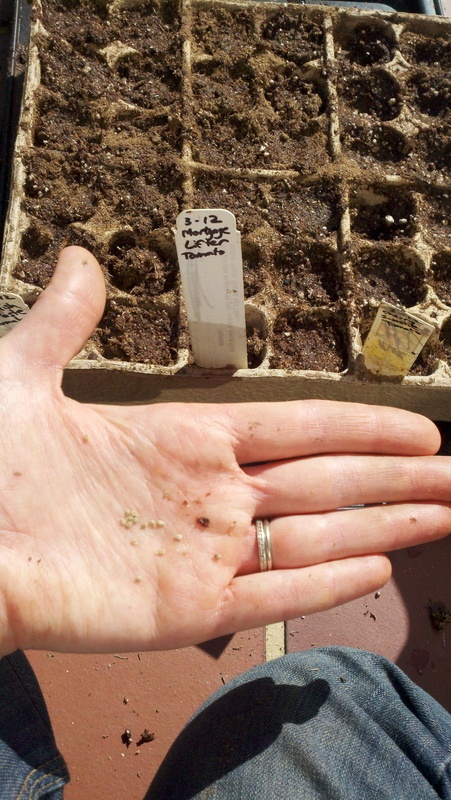 And, obviously, wet soil is important for seed starting…. Since I’d thrown out all my old plastic cells in a basement purge, I needed some containers and opted to buy trays that were pre-filled with potting mix. Ugh. The water floated on top and it was impossible to stir it around, so I ended up dumping the soil out and mixing it by hand in a bowl, then putting it back in the trays, then planting the seeds. 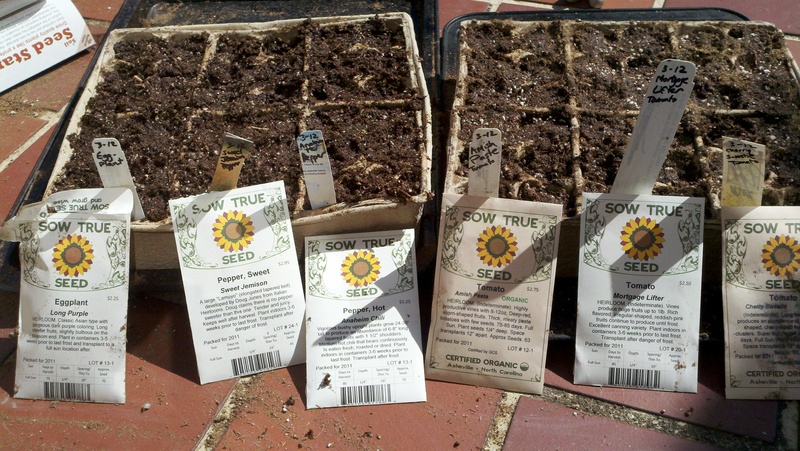 I’ve not ever tried those peat pellets — I’m curious as to whether they work, might try them on the next round of seed starting. The rest of this sunny warm weekend included a pasta dinner. 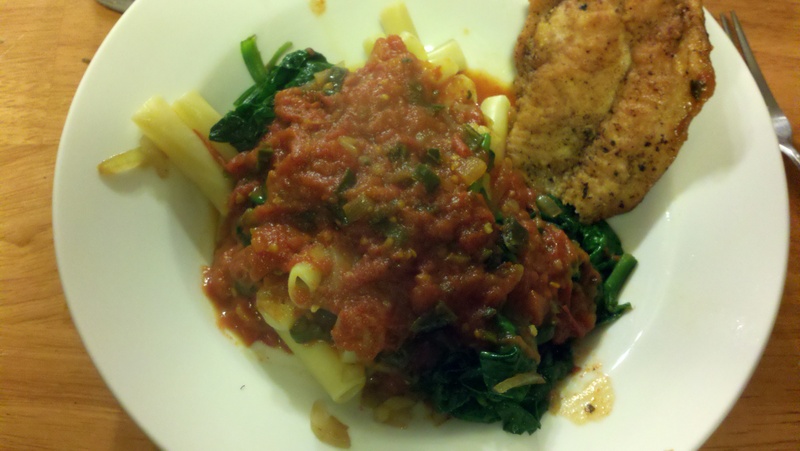 James made the sauce from our spinach, some of last summer’s frozen peppers, and stewed tomatoes (we’re down to the last couple quarts in the freezer). Yummmmm…. 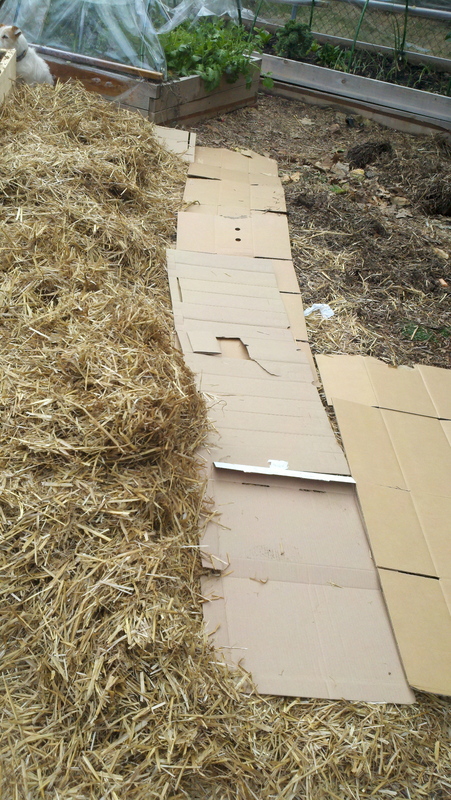 And to ward off weeds growing up around the raised beds, I went to the recycling drop-off center and picked up a bunch of cardboard boxes, laid them out flat and covered them with straw. 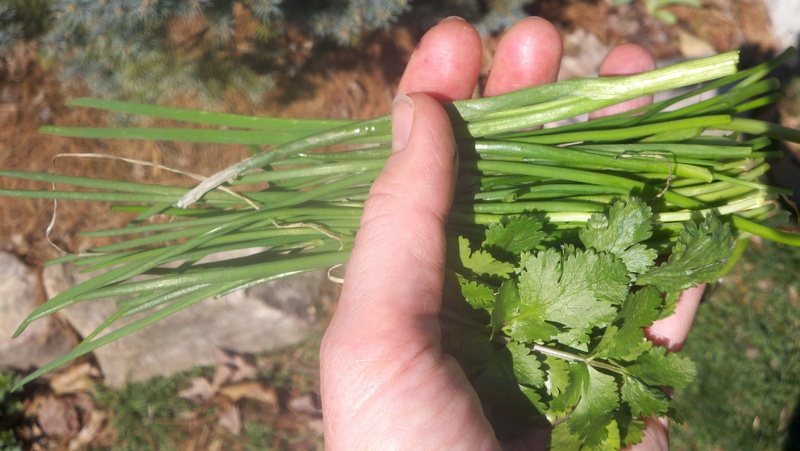 That worked so well last summer — it not only kept the weeds down but helped keep the paths from getting mud bogged. At the recycling place, I kind of felt like I was reverting to post-college dumpster-diving days (I was a minor-leaguer, only got magazines from the recycling bins). I was feeling conspicuous, felt like I was a little too old and not hipster enough to be doing that anymore. I’m also a little self-conscious about getting stuff out of the recycling as my mom likes to find and “save” stuff (on a large scale — she found and got somebody to fish a stove out of a dumpster once — long story). Sadie and Buster thought I’d put the straw out especially for them. 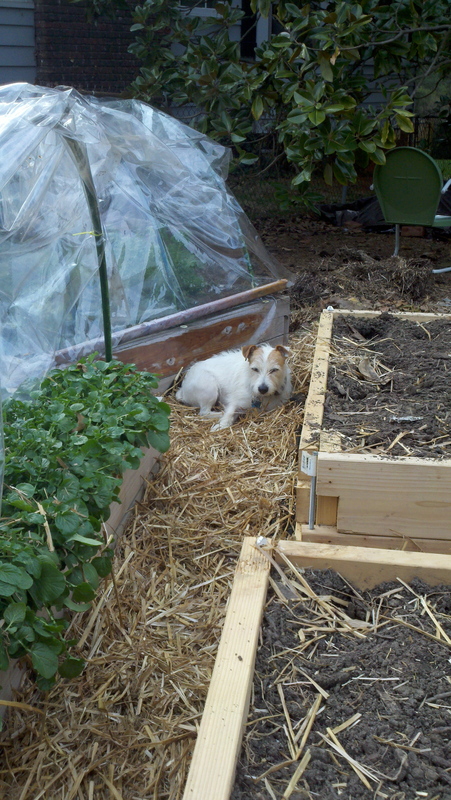 They found new napping spots within minutes of my scattering the straw over the cardboard. The boys were also drawn to it, scooting the straw around with their tonka tractors. And of course, cardboard boxes are the best toys…they ended up putting one long one over the rock steps in the backyard and turning it into a slide. Wow. Amazing garden. We are in an apartment while we are in school, but can’t wait to have a yard just so we can have a garden again.